Subscribe to comments with RSS or TrackBack to 'Nats Off-season News Items Wrap-up 1/31/12 edition'. In the head scratcher department, the Nats & John Lannon went all the way to arbitration even though they were a grand total of 12% apart. Somebody there was being thick headed. 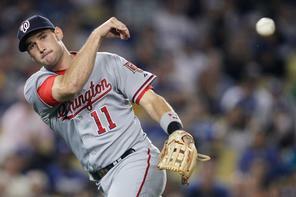 On the other hand, though, I still always reach the same conclusion: The Nats have to extend Zimmerman. At the plate, he’s a great (and frequently clutch) hitter. In the field, he’s an excellent (and occasionally spectacular) third baseman. In the clubhouse, he’s the “face of the franchise” and a positive influence (although he’s often referred to as a “quiet leader,” which I generally read as code for a player who leads by example, but doesn’t actively assume a leadership role, unlike—supposedly—Ian Desmond). So, all told, I say resign Zimmerman now rather than later, if for no other reason than because his price will be slightly lower now than it will be if he has one of those seasons where he plays like Roy Hobbs. … and inevitably Lannan’s ego was squashed when he “lost” the case and now “only” will make $5M/year. Of course, the Jackson signing (which came out of nowwhere really …) probably means we look to trade Lannan for a CF (really the only position we’re looking for on the team at this point, Desmond concerns aside). Rizzo seems to have taken lessons from Stan Kasten in how to have a press conference and say ABSOLUTELY NOTHING. Jackson is a big tease, but in the end only a #4 or #5 starter. At $10,000,000 (!!). Doesn’t Boras have any clients who can hit and play outfield? Yeah, we already got both of them. Harper and Werth!